I was sure stymied when the MOTH came home with a little collection of miniature vintage Japanese crochet dolls. And for some reason, this collector had 2 of everything -- twins? 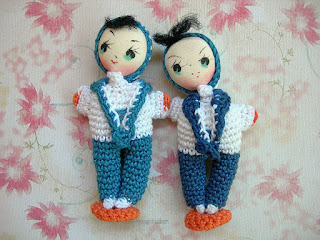 Pair of vintage amigurumi (crochet) dolls in "sailor suits"
Fortunately, I found a similar doll (thank you Google image search) and learned a little bit about the interesting craft of Japanese amigurumi. 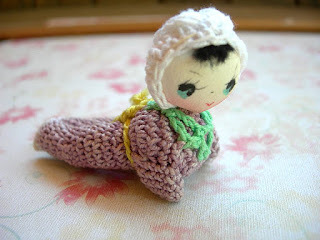 Miniature Japanese crochet doll (amigurumi) crawling along in a purple onesie and bonnet. Here's a little bit about the ones we found: Ami is the Japanese word for "knit/crochet," and nuigurumi is Japanese for "doll." They became more popular after WWII and on into the two-thousandsies. Mine are crocheted and stuffed, and their faces are hand painted. They measure about 2-3 inches in height and each one is slightly different. These make nice little gifts, but I would not use them as toys, they're mainly for collecting, a la other Japanese Kawaii-style items.